The iPhone X might be the most beautiful and powerful smartphone Apple has ever made, but it’s also the most fragile iPhone ever. In fact, it might be the most fragile smartphone, period. The glass front and back tend to shatter even from short drops if they land the wrong way, and the stainless steel is very prone to scratching. You need a case, there’s no question about it. Of course, you also just spent over $1,000 on your iPhone X, and not everyone wants to cough up a lot more cash on top of that for a case. In this post, you’ll find five different case options that are all popular, all sleek and stylish, and all under $15. •High quality TPU case cover for iPhone X. Case stays Thin and Lightweight for less bulk and an accented slim profile, which highlights your iPhone’s original line and design, Simple and Elegant. 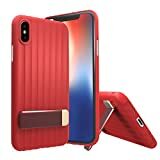 •Multifunctional iPhone X case: Air vent holder Magnetic design, with stand function. Using premium materials and high-precision lasers. •Unique design allows easy access to all buttons, controls and ports without having to remove the case. All connections are easily accessible thanks to precision apertures and adjustments. •Provides protection from dirt, scratch, bumps and grease. Your iPhone will be protected against scratches, your camera lens will be protected as well. LIFETIME WARRANTY — We provide you with lifetime manufacturer’s warranty and 30 days no-questions-asked return or refund guarrantee. 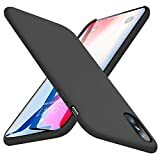 FREE GIFT — The silicone soft iphone X case will come with tempered glass HD screen protector for your iPhone X. 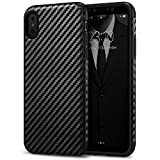 MATERIAL — The iPhone X protective case is made from eco-friendly liquid silicone, and microfiber cloth cushion for inner material, providing soft and smooth texture, scratch-resistant and anti-crack performance. DESIGN — The cutouts of the case are precise to fit all the buttons and ports. The lips of the cover is designed 0.06 inches higher than your iPhone level to effectively protect the screen and camera. ULTRA FITTING — This slim cover fits snugly with your iPhone X /10 (5.8″). It is lightweight and slim without adding any bulk to your iPhone. 【Compatible With iPhone X】 Designed for Apple iPhone X (2017) 5.8 Inch. 【All Round Protection】 The iPhone X case using the advanced shock absorption technology with air cushioned in four corners, protect against shocks or drops. Anti-scratch hardshell PC and flexible TPU bumper offer maximum protection. Raised bezels protect back camera and screen off flat surface. 【Perfectly Fits Your iPhone X】 Precision cutouts for all buttons, ports, speaker and camera. Clear hard PC case and TPU bumper offer grip and a slim profile. 【Scratch Resistant】 This iPhone X case is more endure scratches and scuff marks more than a regular case. Longer life and cleaner look for your iPhone X. 【Lifetime warranty】: ★★★★★ We back this case with lifetime warranty. If you meet any question, please contact us, we will fix your issue within 24 hours.